Middleton gave birth to an nearly 4-kilogram boy at the St. Mary's Hospital, and of course, she and Prince William debuted the newborn at the steps of Lindo Wing before the family heads back to the Kensington Palace. Kate Middleton has given birth thrice, and every time she is seen wearing a Jenny Packham dress during her royal baby debuts. After an 11 hour ordeal - including an overnight stay in hospital - it seemed the new parents fancied more than the gourmet grub on offer at the Lindo Wing. and ordered a pizza. Pippa, who memorably served as one of Kate's bridesmaids in 2011, is a frequent visitor to her sister's 22-room Apartment 1A residence. The statement further expressed how happy the royal family was for the new addition. It was announced on Twitter and also proclaimed in the forecourt of Buckingham Palace with a framed notice perched on a golden easel. William was marking Anzac Day in London with Prince Harry and Meghan Markle, who had attended a remembrance service at Wellington Arch in London's Hyde Park Corner at dawn. 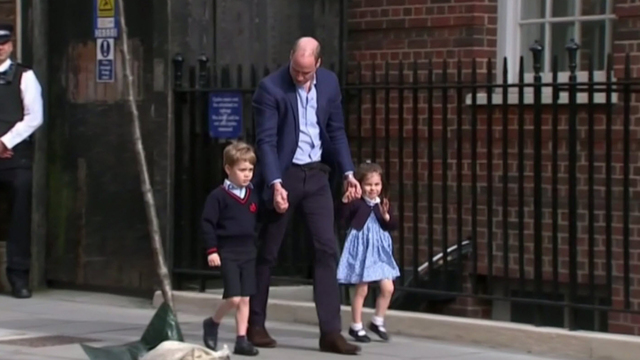 The baby is a younger brother to 4-year-old Prince George and Princess Charlotte, who turns 3 next week. (The soon-to-be-wed Prince Harry has actually been pressed to 6th location.). For Prince George and Princess Charlotte, the name announcement also came two days after the birth. Monday is St. George's Day, England's national day, but the baby is unlikely to be given the name since his older brother already has it. Before the rules were changed in 2012, male heirs took precedence. As in her previous pregnancies, the duchess suffered from hyperemesis gravidarum, a severe form of morning sickness. Another source for the site added that a bespoke Jenny Packham dress of that style - one not even commissioned by royalty - might usually go for "upwards of $2,500 depending on the time and fabric". Vogue reported that, while advocating for a mental health campaign, Prince William said that he and his wife want their children "to grow up feeling able to talk about their emotions and feelings". In Diana: Her True Story, Princess Diana revealed that her husband was disappointed when their second child was born after expecting it to be a girl, which he dismissed as a joke. "St. George himself would be very pleased if the baby's born today". Is Pak former cricketer Imran Khan heading for 'hat-trick' of divorces?